Image: DC Comics. Batman #38 art by Travis Moore and Guilia Brusco. Few comic book heroes have a rogues gallery like the Dark Knight—and even fewer can match him for archnemeses that plunge the darkest depths of villainy simply as a reaction to Batman’s very existence. But Batman’s latest foe is an intriguing mystery, and one that delivers a creepy take on this familiar Bat-concept. Batman #38—by Tom King, Travis Moore, Guilia Brusco, and Clayton Cowles—is far removed from the jovial tones of the series’ most recent story about Batman’s engagement to Catwoman and his friendship with Superman. While that story, “Super Friends,” held up what Bruce Wayne means to the people who know him best, “The Origin of Bruce Wayne” holds up Bruce’s impact on people who barely know him or what he’s been through at all, in a toxic, grim way. The story centers around a young boy named Matthew, who turns to Bruce when his parents (who worked for the Wayne Corporation) are found brutally stabbed to death. On the surface, there’s a lot of comparisons to Bruce’s own tragedy—a rich kid left traumatized and orphaned by the dark side of Gotham City. He’s even got his own butler, and jokes about how his parents used to compare him to Master Wayne before their untimely demise. The shared trauma between himself and Matthew spurs Bruce to strike out as Batman and solve the case, but everything seems a little too easy at first. The wild slashes on the parent’s bodies quickly point Batman to Victor Zsaz, who seems all too eager to claim the killings for his own despite the fact he has a clear alibi—but Zsaz’s involvement in turn leads Batman to another clue and another grim murder, that of Zsaz’s own parents, confusing matters even more. It’s only when a third couple winds up dead, this time with their bodies splayed out in a numerical clue in an attempt to implicate Two Face, that Batman starts to put everything together—someone is framing his gallery of villains, giving him clues and riddles to solve like the great detective he is, feeding into the Batman mythos to mask their true identity. After figuring out the real hint behind the gruesome clue, Bruce finds what he thinks is the true villain: Taylor, Matthew’s own butler, who confesses to murdering Matthew’s parents to become the sole guardian of the child’s sizable estate. With Taylor punished, and Matthew’s parents given justice, it almost seems like the day is saved. The young orphan thanks Bruce for his help, noting that he hopes the experience will help him forge a life for himself like the one Bruce has after his own tragedy. Bruce and Selina share a dinner together, reflecting on Taylor’s betrayal of a butler’s position with Alfred. But one final switch flips in Bruce’s head. Everything about Matthew’s case has been off—the grand puzzles too flawed to hold up to Batman’s typical rigor. The framing of one villain after the other, seemingly at random... there’s something childish about it all. All the similarities between Matthew and Bruce suddenly become less of a tragic circumstance and instead all too chilling, like pieces of a gruesome puzzle being slotted together. If a butler like Taylor is meant to do anything for his ward, like Alfred does for Bruce, what if the ward wants something truly terrible, something born out of years of sitting in the shadow of another billionaire orphan he was always told to look up to? Taylor did murder Matthew’s parents, but he didn’t do it for money. He did it because Matthew told him to, to complete the young boy’s grim transformation into his idol. 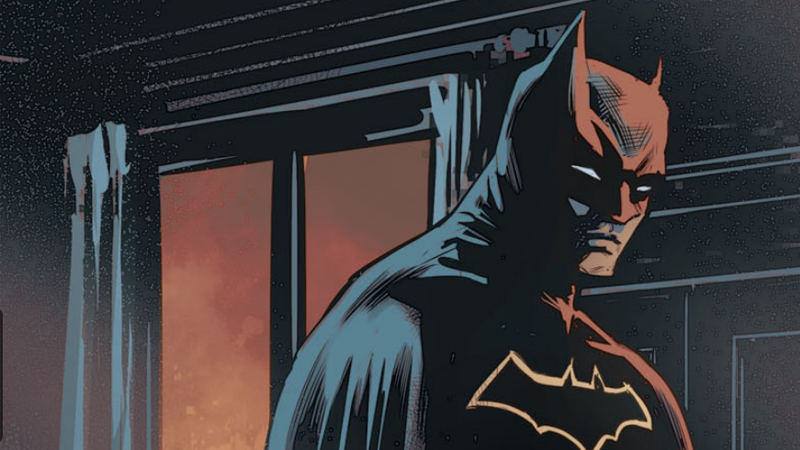 Matthew’s warped mind, not making the connection that what Bruce’s own trauma did to him was turn him into Batman, thinks that only in being wholly like Bruce Wayne—right down to the tragedy of Bruce’s early life—could he ever be as successful, could he ever be as good for Gotham. So many of Batman’s foes are inspired by, or are a direct response to, the imagery of Batman himself—villainy rising up to match the theatricality of the Dark Knight. To see one inspired by Bruce Wayne instead (for all the wrong, twisted reasons) is a rare occasion, and leaves a lot of potential for Matthew, should he return, to become a fascinating foil for Bruce.